Pet poisoning is a serious problem. Ingestion of harmful foods and chemicals is among the top reasons that pets require emergency care. However, with proper awareness and precautions, pet poisoning is preventable. • Flea and tick preventives - Always follow recommended dosages and instructions and never use treatments intended for a dog on a cat. Exceeding recommended doses is dangerous and not the way to kill more fleas and ticks. 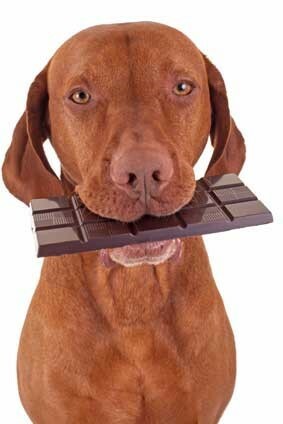 • Human food - Chocolate, garlic, onions, grapes, raisins, macadamia nuts, the artificial sweetener xylitol (found in sugar-free gum), and avocados are toxic to pets. • Plants - According to the Pet Poison Helpline, the most common poisonous household plants are the autumn crocus, azalea, cyclamen, kalanchoe, lilies, oleander, dieffenbachia, daffodils, lily of the valley, sago palm, tulips and hyacinths. And don’t forget about poinsettias, mistletoe and holly during the holidays. • Rodenticides - Use with extreme caution because they are engineered to be appetizing. The most common type uses an anticoagulant, which causes internal bleeding and death. • Pest control baits and insecticides - Though less harmful than rodenticides, bait containers themselves post a risk if ingested. • Lawn and garden chemicals - Allow for proper drying time (up to 48 hours) in the area before giving pets access to treated areas and plants. • Antifreeze - Antifreeze is very sweet and attractive to dogs. There is an antidote but it must be given shortly after ingestion, so if you suspect ingestion seek veterinary attention immediately. Keep cleaners and other harmful chemicals in a secure, or locked cabinet and clean up any spills immediately. Use organic alternatives whenever possible. Keep all medicine in a bathroom and if you are concerned about your pet gobbling a dropped pill, close the door before taking. Keep people food out of reach and remind all family members and guests not to feed your pets. Remember that a determined or bored pet can chew through containers, bottles and even child-safe locks. If you suspect that your pet has eaten something poisonous, act quickly. Contact your veterinarian, local emergency hospital, and/or the Pet Poison Helpline at (800) 213-6680.